Are you interested in deploying Google Chromebook™ laptops as workstations but aren’t sure about their capabilities? Are you concerned they won’t support Windows applications and desktops? If you choose the right application and desktop delivery solution, they do support all of that—and provide an intuitive, secure, high-end user experience. Rapidly increasing sales of Chromebook make it a good option as a thin client. However, Windows RDP offers limited features for Chromebooks. Application delivery and VDI solutions overcome the Microsoft Remote Desktop Services (RDS) limitations, allowing you to run any Windows application and desktop on Chromebooks via RDP. However, application delivery and VDI solutions such as VMware Horizon and Citrix Virtual Apps and Desktops are expensive and demand complex configurations, almost nullifying the advantages offered by Chromebooks. Parallels® Remote Application Server (RAS) is inexpensive and easy to deploy, configure, and maintain. It offers full support to Chromebooks, allowing organizations to provide employees with a seamless user experience on Windows and Chrome applications, anytime. Combined together, Parallels RAS and Chromebooks are a great solution for creating a cost-effective, pseudo thin–client environment. A lightweight laptop, Google Chromebook is designed to primarily run in the cloud and uses Google Chrome OS™. Most of the documents and apps live in the cloud, which means the device should always be connected to the Internet. The absence of a dedicated hard drive makes it a low-cost option. Its low cost—it’s less expensive than a mid-range smartphone. Minimal configuration results in faster performance—the device loads within eight seconds. The device is lightweight and portable. It comes with a longer battery life compared to other mobile devices. It’s easy to use—simply open the browser and access all applications and documents in the cloud. Ever since Google released the first Chromebook, its sales have been on the rise. 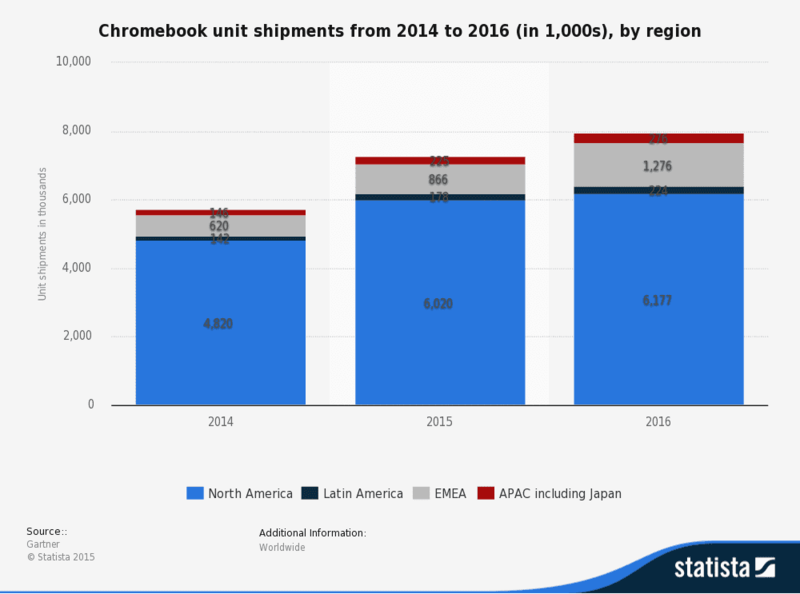 According to Global Markets Insights, 5.3 million Chromebook units were shipped in 2014. This value is expected to reach 17 million by 2023. The education sector is the biggest market for Chromebooks, accounting for 73% of sales. (The highest concentration is in grades 6–8 with 77%, followed by grades 9–12 with 71%.) Chromebook sales have surpassed Mac® within five years, as reported by IDC. Looking at the numbers, it is evident that Chromebooks are here to stay. The increasing usage of Chromebooks as thin clients means administrators must explore options to connect these devices to windows networks via Microsoft RDP for Chromebook. Low cost, lightning speed, and minimal configuration make Chromebook a good choice for a thin client. However, it doesn’t support Windows applications. As the majority of network devices run Windows, it is important to connect Chromebooks with Windows machines—which means Microsoft RDP for Chromebook is required. While there are a few workaround options, Parallels RAS offers a comprehensive virtualization solution for Chromebooks. Efficiently deliver Windows applications hosted on hypervisors and Windows remote desktop servers to any device, anywhere. By hosting applications in the private cloud, businesses benefit from reduced administration and help desk support time and can easily control access to applications. Parallels RAS has extensive experience supporting the education segment. Educational institutions rely on Parallels RAS to deliver Microsoft Office applications to Apple or Chrome OS, increasing the productivity of staff and students without increasing licensing costs. Parallels RAS has helped many institutions and organizations get the maximum possible benefit from the private cloud. Learn More. Download your free 30-day trial of Parallels RAS today!